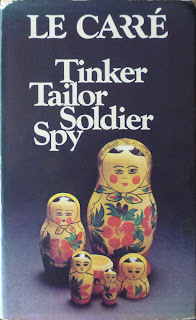 And so we reach the climax of John le Carré/George Smiley Week, a week which has seen an overlong examination of two first editions of le Carré's masterwork, 1974's Tinker, Tailor, Soldier, Spy; a review of its follow-up – and the second instalment in the "Karla Trilogy" – 1977's The Honourable Schoolboy; another review of the third part of the Quest for Karla, 1979's Smiley's People, and its attendant 1982 BBC TV adaptation; and a look at Smiley's final appearance, in 1991's The Secret Pilgrim, ably assisted by the erudite Roly Allen. 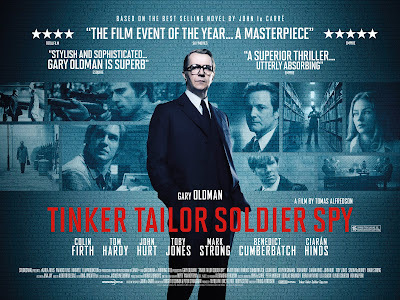 And we finish, slightly later than planned (I had hoped to get this post up over the weekend, but no matter), with some thoughts on Swedish director Tomas Alfredson's brand new Tinker Tailor Soldier Spy movie, which hit British cinemas on Friday and is, lest we forget, the reason for all this le Carré blogging. And I'm delighted to report that the film is magnificent: not quite as magisterial as the original novel, but even better than the 1979 BBC adaptation, whose long shadow it manages to elude. Where it benefits is, surprisingly, in its relative brevity. Clocking in at just two hours, it's less than half the length of the Alec Guinness-starring television version, but the compacting of events helps to clarify them, going some way towards countering the complex nature of the plot. There's still a lot to take on board: an opening mission to Hungary (Czechoslovakia in the original novel) which results in British intelligence operative Jim Prideaux (Mark Strong) being shot; the consequent ejection from the Circus (the colloquial name for MI6) of Control (John Hurt) – whose off-the-books directive sent Prideaux to Budapest – and Control's number two, George Smiley (Gary Oldman); the ascension of Percy Alleline (Toby Jones) to head of the Circus; and the introduction of fellow Circus big beasts Bill Haydon (Colin Firth), Toby Esterhase (David Denick) and Roy Bland (Ciarán Hinds). And that's before we even get to Smiley being brought back out of enforced retirement to hunt down a mole at the top of the Circus, assisted by Peter Guillam (Benedict Cumberpatch); the introduction of "rogue" agent Ricki Tarr (Tom Hardy), who has vital information about the mole; the further introduction of bit-part players Kathy Burke (Connie Sachs, the Circus' expert on Russia), Svetlana Khodchenkova (Irina, the object of Tarr's affections) and Simon McBurney (Oliver Lacon, Permanent Secretary at the Cabinet Office); and the concept of "Witchcraft", the name for the source of the Circus' information on the Soviet Union, and the means by which Percy Alleline is propelled to his elevated position. That the movie Tinker Tailor retains all these characters and plot elements and is still comprehensible (if you pay attention) is no mean feat in itself, but even more remarkable is the way the film also taps into the novel's escalating tension, something which, to my mind, was largely absent from the Beeb version. There are alterations, mainly to do with locations, although one character becomes a closet homosexual, a trait which, if it is in the novel, I must admit rather passed me by. But for the most part the film is quite faithful. Necessarily that means it's a period piece, but the story's theme of betrayal – both geopolitical and emotional – remains timeless. The early 1970s setting is both effectively recreated and lent an aesthetically pleasing art-house gloom; the Circus is realised as a cavernous warehouse dotted with curious office "pods", the most striking of which is the soundproofed main meeting room, its convex orange walls giving it the appropriate appearance of a hellish lunatic-asylum cell. The performances are uniformly excellent. Oldman's Smiley has been getting all the attention, but for me John Hurt's irascible Control, Colin Firth's suave, agreeable Bill Haydon and especially Tom Hardy as poor, doomed Ricki Tarr are standouts. As for Oldman, I can't recall ever seeing him this still, this internalised: his Smiley betrays little emotion, aside from one raised-voice moment towards the end. It's a mannered performance, for sure: all slow reactions and creaking turns; but then so, in its own way, was Alec Guinness's (neither Oldman nor Guinness are/were "naturalistic" actors). Probably Oldman's biggest scene as Smiley comes when he tells Peter Guillam about his encounter with his nemesis, KGB supremo Karla, in India many moons ago; here the film hews closer to the source text than the '79 TV version, which showed the meeting rather than – as happens in the movie – having Smiley recount it. But three other Smiley moments stayed with me, all of them, I believe, new inventions by Alfredson and screenwriters Bridget O'Connor and Peter Straughan. The first of those arrives early in the film, in a scene – not in the novel – showing Control's deposing during a meeting. When asked, "And what about Smiley?" Control replies, "Smiley is coming with me" – a statement which appears to be news to George: Oldman's reaction is of barely suppressed astonishment. The two traipse through the bowels of the Circus and finally stand facing each other on the pavement outside. There is no salutary handshake; wearily, Control simply turns and walks away, leaving a bemused Smiley to do the same, his life effectively over. The second moment is a direct nod to Alec Guinness, and comes shortly after Smiley's dismissal. Up to this point, while Smiley is bespectacled, his glasses are quite ordinary: thin-rimmed, unremarkable. But his eyesight worsens in retirement, and a visit to the optician's results in a new pair of spectacles: bifocals, similar to those sported by Guinness in 1979. As for the the third moment, that acts as a triumphal coda at the film's close. I shan't spoil it, except to say that it sets up a sequel in a way that the novel doesn't, and is underlined by a suitably jolly and debonair cover version of Charles Trenet's "La Mer" by Julio Iglesias. There are other new additions, notably a shocking execution and a recurring scene depicting a Christmas party at the Circus, which features a blink-and-you'll-miss-it cameo by le Carré. Even so, the spirit of the novel remains intact. 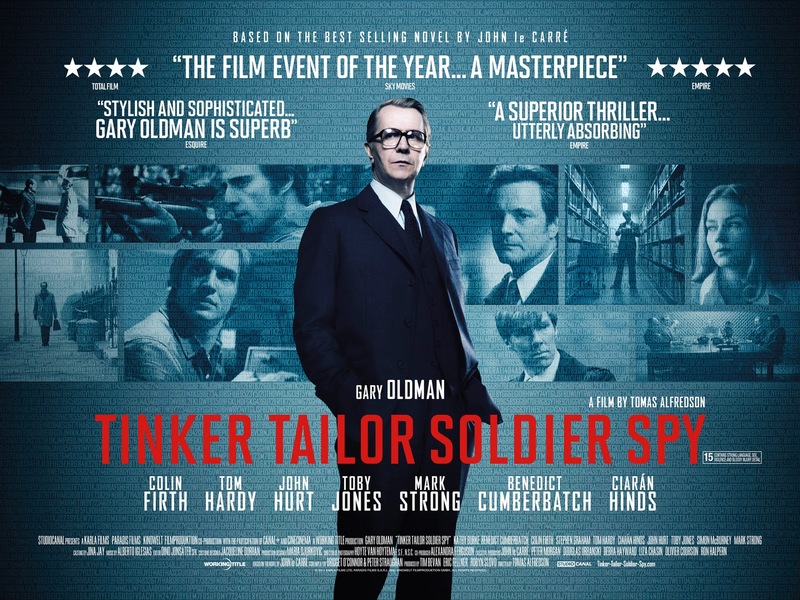 By any measure Alfredson's (comma-less) Tinker Tailor Soldier Spy is a triumph, better than we had any right to expect and a definite a contender for film of the year. It really is that bloody good. I completely agree with you about the film, and if I could find anyone giving odds on Oldman getting (his first, amazingly) Oscar nomination, I would happily fill my boots. Let's hope the US boxoffice/reception leads to the sequel which is begging to be made: Smiley's People. I think they can easily miss out The Honourable Schoolboy, but if they don;t, they'll have to rename or recast Jerry Westerby: Stephen Graham is a great actor, but Westerby's no Scouser! Hmm, you might be right. Certainly when I was reading Honourable I didn't even recall Jerry being in Tinker Tailor. Thanks to the film's Wikipedia entry, which lists differences from the novel, I can confirm that Westerby does not feature in the novel in the way the film's used him. In the book, the guy brought in by Control to the watch the shop on the night of Operation Testify is Sam Collins (who goes on to feature in The Honourable Schoolboy I think?). I wonder why they decided to change him to Jerry for the film? In the TV version of Tinker. there's a scene where Smiley has dinner with a tiresome Jerry Westerby, played to perfection by Joss Ackland, but I can;t remember if that's in the book either. There's still plenty of Smiley in The Honourable Schoolboy, I think, certainly enough to make that strand the focus of any prospective film. 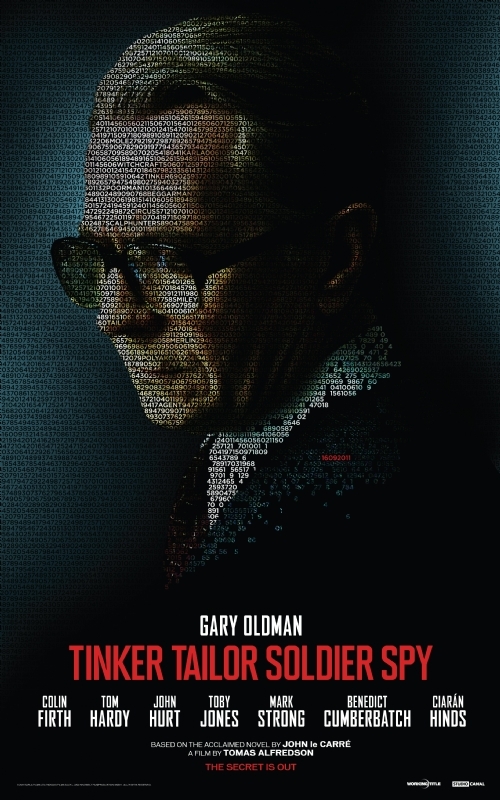 But I guess we'll have to wait and see: by all rights Tinker Tailor should do well enough to warrant a follow-up. Sam's in Honourable, yep: Smiley brings him back into the Circus to help unravel Karla's trail. And now I do dimly recall Jerry popping up in the novel of Tinker Tailor. I dunno: what did we all do before Wikipedia came along? Sounds utterly fantastic! I can't wait for it to come to America. I hope Universal's delay tactic pays off and does indeed position the film well for Oscars. Mainly because I hope Oscar buzz will improve the American box office and lead to a sequel! Like you, Louis, I really, really want to see them do Schoolboy next. It's a great novel and, unlike Smiley's People, it's never been filmed. Adam, I respectfully disagree that they could easily miss out on it. I think the fact that BBC did that has given people the idea that it works out fine. It did for them, but the trilogy of books is so much richer for its middle installment, and so could be this new potential film trilogy. (Dare I say it?) While Westerby's story is sort of a standalone from the other two Karla books, I think that Smiley's experience in Schoolboy greatly informs his actions in People, and make the various character payoffs then that much more satisfying. I'm glad to hear from Louis that hte end of the movie would seem to set up Schoolboy, since Oldman recently jumped to People when talking sequels on the red carpet. As do I! Perhaps if enough of us shout loudly enough, we'll get the result we desire. Thanks for the thoughtful comment, Bill! Don't get me wrong, I'd rather see two sequels to this film than only one, but I just have a feeling that they'll hop to Smiley's People if they do a follow-up. I agree that Hugh Bonneville would make a great on-screen Westerby, though I'm sure they'd try for a bigger star if a Honourable Schoolboy film did go ahead. Colin Firth would have been good, if they hadn't already cast him as someone else... Hugh Grant? I think he'd actually be rather good, though audiences tend not to want him in anything other than light comedy. Hugh Grant's an interesting choice for Westerby; not someone who immediately springs to mind for the part, but I can see your thinking. I suspect you might be right about them going straight to Smiley's People, but while I'll keep my fingers crossed for The Honourable Schoolboy, any kind of sequel would be fine. Oh, Hugh Grant's a very intriguing idea! You're right; not someone who would readily spring to mind, but the sort of casting I can see working quite well. Well done whoever suggested Hugh Grant for Westerby - I only came across this page after googling "Hugh Grant" and "Jerry Westerby" to see if anyone else had already had the idea. In the run-up to TTSS's release I decided to re-read The Honourable Schoolboy and had the familiar problem of trying not to visualise Joss Ackland's performance from the TV Tinker ... In doing so, I tried mentally casting a THS movie and came to the same conclusion that Grant would be ideal (he's just about the right age now, too). Credit where it's due - Joss Ackland is perfect as the Westerby of Le Carré's Tinker Tailor Soldier Spy, but - as someone has already pointed out - Le Carré clearly re-invented the character for the follow-up and he's quote a different fish indeed. Definitely not Stephen Graham. 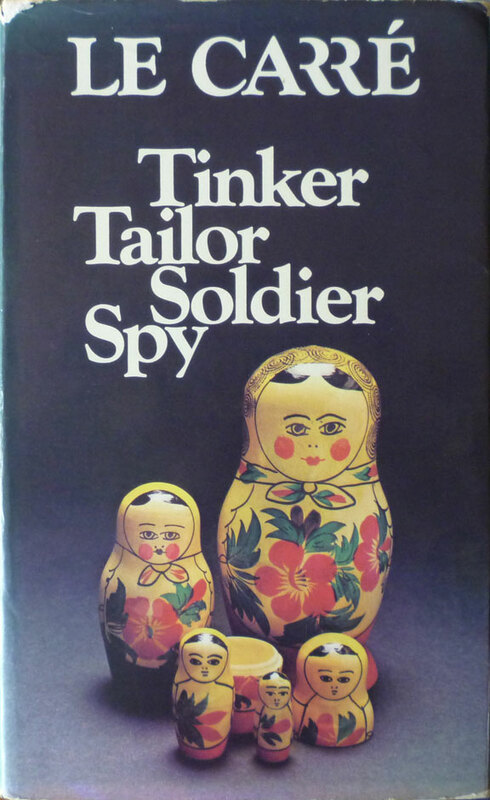 Tinker, Tailor, Soldier, Spy - the title adapted from a nursery rhyme - is a serious read. It is not an easy read, not a fun read, but a read for the discriminating mind seeking serious fiction. The cold war is now past. But the shadowy workings of the tradecraft is still current. This novel captures it in all its realism without sensationalism. It is a simple novel with a complex plot. Quite so, Luxembourg. Thanks for the comment.